The American Association for the Advancement of Science (AAAS) will host its 2018 Annual Meeting in Austin February 15th through 19th. The conference theme this year is “Advancing Science; Discovery to Application” — and CCST staff, CCST Science Fellows, and CCST Science Fellows alumni will be participating. Join us at the CCST Exhibit Booth, #1524, from Friday through Sunday in the AAAS Exhibit Hall, and get to know our CCST mission, projects, and programs. 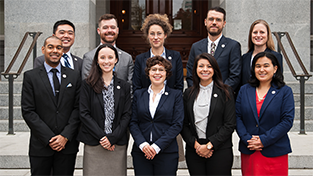 Come learn how CCST works with the California state government to help make policies stronger and informed with science — and hear firsthand accounts of the CCST Science & Technology Policy Fellowship experience from CCST Science Fellows alumni themselves. We look forward to meeting scientists, science communicators, and science policy specialists from around the world as they converge in Austin. Take a picture and tweet at us during #AAASmtg by mentioning @CCSTorg or @CCSTFellows — and share our message of making public policy #StrongerWithScience. See you all in Austin! 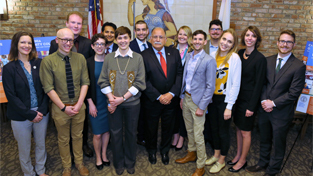 Reminder: CCST is now accepting applications for the 2019 Class of our CCST Science & Technology Policy Fellowship. Completed applications are due February 28th, 2018.